Now that spring is upon us and the wind doesn't sing through my leaky poor man's craftsman bungalow, the days lengthen, and the sun shines even more, you'd think this Californian would relax back into her favorite ripped-up Blondie tee shirt and enjoy the hiking trails. But instead, I am packing my camera and laptop to head north to Homer, Alaska to taste real winter. Or at least the tail end of it. From the Spring Equinox to April Fool's Day, I will have my mind blown by Mother Nature's expression in Alaska. “It's on a whole different scale,” my friend Ian says. I will be in snow –a rare event for me, I will ride in a dogsled for the first time, enjoy locally brewed beer, and predictably, eat some salmon. publication in 2005, the book I helped Ianto Evans write, that started out as a pamphlet called Rocket Stoves to Heat Cob Buildings, has grown into a cottage industry. And much to my surprise and delight. 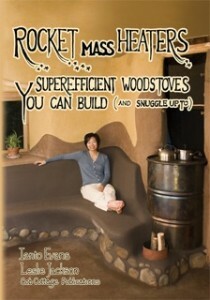 It is now a real paperback with a glossy cover called Rocket Mass Heaters: Fuel-efficient Wood-Burning Stoves YOU Can Build (and snuggle up to). It has been translated into French and Japanese. We are working with translators now who will take it into German and Spanish, and I just heard from an Irishman who offered to translate it into Czech. 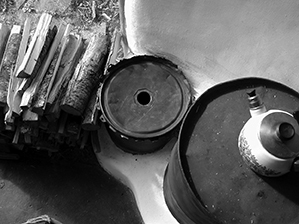 There are countless YouTube videos—from the absurd to the sublime—documenting these stoves. People are participating in discussion forums all over the world. And there are two Facebook groups, with over a thousand members between them. How did this happen? 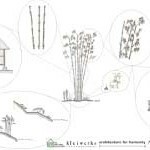 The rocket mass heater is a make-it-yourself wood-burning device, based on the principles of the rocket stove, which because of its geometry and materials burns bio mass really efficiently. 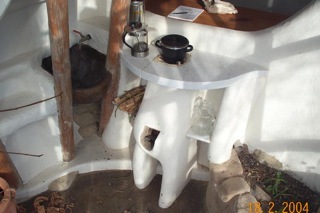 The rocket mass heater takes the heat so efficiently produced and stores it in thermal mass—in most cases, cob—benches and beds. These stoves are for human comfort. You sit and lie down on them. They're for tinkers, inventors, and people in love with fire. I've been assuming we had an underground audience, but at least 30,000 copies are in circulation. That's a lot of underground to cover! Who are these people? I want to meet them all. While I hustle on the third edition of Rocket Mass Heaters with Ianto, I am simultaneously curious about who is out there building—and improving—these stoves. So off I go, with my Olympus OM-D5 and MacBook Pro in search of stovers. I'll keep you posted! Click here to order your copy of Rocket Mass Heaters today!